Perhaps the least celebrated of all the Muscle Shoals musical enterprises was the Paradox label started by James Thomas and Bill Cofield. Cofield was a saxophonist who had played with Jimmy Johnson in the 50s as well as featuring on several Quin Ivy sessions including Percy Sledge’s “When A Man Loves A Woman” but Thomas had no musical experience. Their venture was a part time operation with Cofield earning his living as a draughtsman and Thomas as an electrical engineer. They purchased Quin Ivy’s first studio in 1969 and set about recording local artists. Their best releases were the brilliant ones by Roy Abernathy and this one by Charlene & The Soul Serenaders. The funky “Can You Win” was pretty good. Even better though was slow Love Changes and this fine piece of Alabama soul features a strong vocal from Charlene Southern. 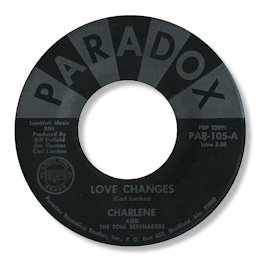 By the time this 45 was marketed to Stax by Jimmy Johnson acting as the intermediary Charlene was pregnant and she and her husband quit the group. When the 45 did nothing the Memphis concern passed on the Abernathy recording. 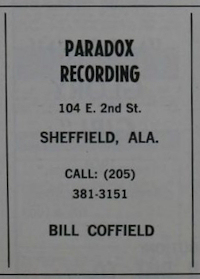 The Paradox studio was sold to Larry Brewer, a Muscle Shoals singer songwriter around 1972 – he in his turn sold it in 1975 after which the building was converted to other uses. PS ~ Like the obscure Ella Keys 45 on Mariteen this has a faux sticker on the label "Certified - A Muscle Shoals Sound". Just love that! UPDATE ~ I'm grateful to Alan Wheway for the update to the discography. Special thanks to Pete Nickols. You can read more about the Muscle Shoals music of Quin Ivy in his definitive history here.